LAWRENCE — In recognition of the University of Kansas' enriching artistic and cultural community, the Campus Arts Week brings together collaborating organizations across campus for a week of exhibits and events. 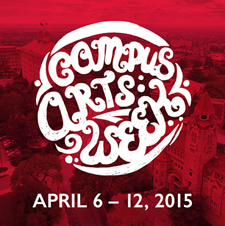 Campus Arts Week will span the week of April 6-12 and is an expansion of the Campus Art Walk held in previous years. Highlights of the week’s events will include a juried student art show, a film screening of Werner Herzog’s “Grizzly Man,” improvisational dance and a University Theatre production. Participants will be encouraged to create themselves by writing “floor poetry,” engaging with interactive happenings, adding to a column of wishes and posing as subjects from well-known art masterpieces. Campus Arts Week culminates April 12 with the Day of Creativity at the Museums. Details about all of the events are available at http://lib.ku.edu/arts-week. Prizes will be given out to Campus Arts Week participants posting photos and fun on social media using the tag #KUARTSWEEK. All events are open to the public. KU Libraries and the Lied Center, Natural History Museum, William Allen White School of Journalism & Mass Communications, School of the Arts, Spencer Museum of Art and Student Union Activities are hosting the events.